Two days ago, 354 players registered for Event #19: $2,500 Limit Hold'em / Six Handed. Today, the final twelve players of that field returned to battle for a World Series of Poker bracelet. It was a back-and-forth day, but in the end it was British-player Darren Woods who emerged victorious to claim the $213,431 first-place prize. Day 3 saw an eclectic mix of players return for their shot at WSOP glory. Among them was the only bracelet winner left in the field, Matt Matros; online superstar Richard “nutsinho” Lyndaker; and last year’s 107th-place Main Event finished, Matthew Schreiber. Unfortunately, those players were among first half of the day’s eliminations, and ultimately missed out on the final table. By the time we reached the final table, six players remained including Kim Nguyen, only the third woman to make a final table here at the 2011 WSOP. She was joined by a very familiar face in Russian pro Alexander Kuzmin, who took down the World Poker Tour Southern Championship in Biloxi, Mississippi back in January for $575,969. Rounding out the final table was Woods, Gabriel Nassif, Andrey Zaichenko, and Samuel Golbuff. It didn’t take long before we had our first final-table elimination when Nassif’s failed to improve against the of Golbuff as the board ran out . 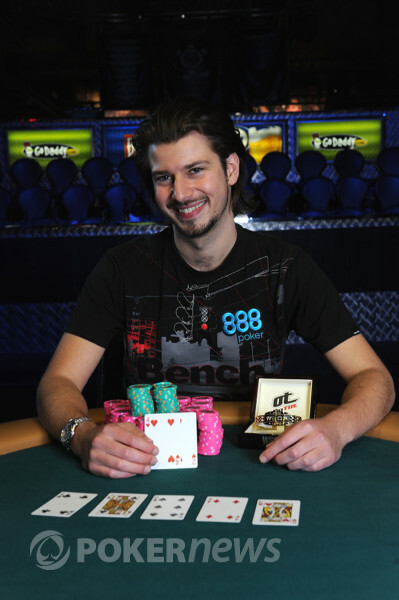 The Parisian pro finished in sixth place, and received $27,720 for his efforts. It took a long time before the next elimination, but it was bound to happen as the blinds just got higher and higher. With the blinds at 8,000/15,000, a short-stacked Zaichenko got the remainder of his chips in the middle preflop with against Woods' . The board ran , and Zaichenko was eliminated from the tournament in fifth place, taking home $39,317. The next player to go was Kuzmin in fourth place ($57,236), whose stack slowly dwindled and was eventually gobbled up by both Woods and Nguyen, who ended up chopping Kuzmin’s final hand. Following the Russian out the door was Golbuff, who also grew shortstacked. He was eliminated in third place for $85,616, leaving Nguyen (1.5 million) to do battle against Woods (1.15 million) in heads-up play. The Amazon Room was abuzz with excitement as the possibility of a woman taking down a WSOP Event was essentially a 50/50 proposition. Not since Vanessa Selbst took down the $1,500 Pot-Limit Omaha tournament at the 2008 WSOP has a woman won an open event. Ironically, that event was number #19, the same event number assigned to this Event #19 $2,500 Limit Hold’em/Six-Handed. Woods started the heads-up match with a bang, seizing momentum early and vaulting into the chip lead. From there, he never looked back as he patiently picked his spots and collected pot after pot. After about an hour and a half of heads-up play, the final hand developed when Nguyen raised on the button, Woods re-raised, Nguyen got the rest of her short stack in the middle, and Woods made the call. 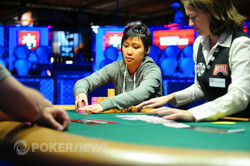 Nguyen was in great shape to double, and the flop kept her in the lead. The on the turn was clean, and all signs pointed towards a double-up until the spiked on the river. Just like that, Nguyen was eliminated as the runner up, an accomplishment worth $131,900. 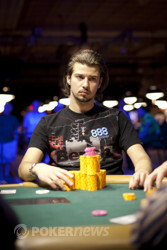 Congratulations to Darren Woods on becoming the latest WSOP Champion and third Brit to win a bracelet in 2011. That does it for our coverage from Event #19: $2,500 Limit Hold'em / Six Handed, but there are plenty of events to follow. Be sure to stay tuned to our Live Reporting section for all the updates, live, from the 2011 World Series of Poker. Kim Nguyen raised with the button, Darren Woods re-raised, Nguyen got the rest of her stack in the middle, and Woods called. Nguyen was in great shape to double, and the flop kept her in the lead. The on the turn was clean, and all signs pointed towards a double-up until the slammed on the river to give Woods trips. All Nguyen could do was laugh - and she has good reason to smile. She bested 352 runners, and earns $131,900 for her second place finish. Nguyen was the third woman to make a final table at the 2011 World Series of Poker, but after falling short this is officially the 179th straight open event won by a male player. However, with the recent success of female players, that number is surely in danger. Darren Woods raised on the button and Kim Nguyen called from the big blind. Nguyen then check-called a bet on the flop, and both players checked the turn. When the hit the river, Nguyen bet, Woods called, and Nguyen mucked after seeing her opponent's . Kim Nguyen raised on the button and Darren Woods called from the button. Woods proceeded to check-call bets on the flop and turn, before both players checked the river. Nguyen has had a rough go as of late, which only got worse as she had to muck after seeing her opponent's . Kim Nguyen once again raised her button and Darren Woods called from the big bind. Woods then check-called bets on the flop and turn. When the was put out on the river, both players checked and Woods showed for two pair and the win. After Darren Woods had raised on the button and Kim Nguyen made the call, both players checked a flop and watched as the hit the turn. Nguyen led out with a bet, Woods raised it up, and Nguyen laid it down. Kim Nguyen raised on the button, Darren Woods three-bet from the big blind, Nguyen responded by four-betting, and Woods made the call to see the flop come down . Woods led out with a bet, Nguyen called, and the dealer burned and turned the . Again Woods bet, but this time it proved to much for Nguyen and she laid down her hand. Darren Woods raised on the button and Kim Nguyen called from the big blind, Both players checked the flop, which was followed by the on the turn. Nguyen checked-called a bet before the was put out on the river. this time Nguyen fired out and forced Woods to lay down his hand.